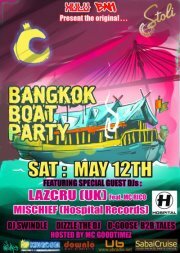 After the huge success of the first 2 Bangkok Boat Parties, Bangkok’s ONE and ONLY River Cruise Party is Back for Part 3!! 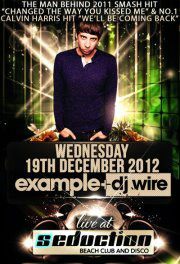 This time around is going to be BIGGER and BETTER with 2 very special guest DJs all the way from UK! Here for his S.E. 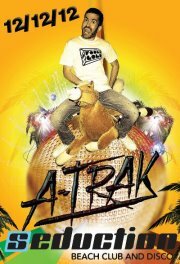 Asian tour: – DJ LAZCRU! And from the massive Hospital Records – DJ MISCHIEF! Join us for this awesome chance to cruise up and down Bangkok’s Chao Phraya River, past ancient temples, modern skyscrapers and under massive bridges. Only 200 tickets available and you must buy them before the party! Get them quick before they’re gone by calling us and we will deliver them to you. 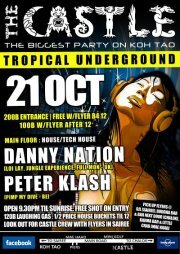 This month we will feature another HUGE line up of Thailand’s finest DJ talent, bringing you the best in both underground dance music and crowd-pleasers. Lazcru will also have special guest MC RICO all the way from Manchester UK supporting him on the night. And of course MC GOODZ is back for the 3rd time and will be hosting the party and supporting all other Djs through the night. There will also be stunning visuals projected onto surrounding buildings, bridges and boats, courtesy of VJ Gorb. The boat is large, safe, and spacious with plenty of clean bathrooms and air conditioning in the lower deck if you get too hot. There will be a professional crew and security team so no one goes overboard, but trouble makers will have to walk the plank.